Ancient possession of the Count of Toulouse, Mondonville is part of Blagnac Constellation and Toulouse Metropole. Its rapid growth closely linked to the development of aeronautics, shows the dynamism of the city. Its closeness to the Bouconne forest green lung and high place of sports activities of the Toulouse region, offers a very pleasant environment for its inhabitants. 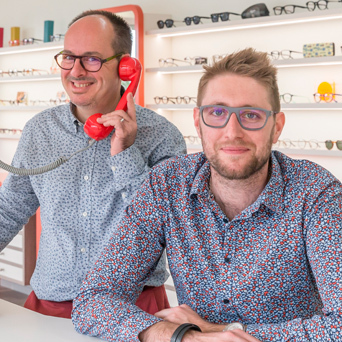 Located at 2 rue de Daux, at the mall Moulin à Vent of Mondonville, the shop opened in 2002 xas taken over in 2007 by Luc, and becomes Brissaud Opticians in 2016. Very attached to customer satisfaction both by the quality of the selected eyeglasses as well as by visual performance, he makes a duo with Anthony, a young enthusiastic optician. They draw together a partnership of trust with the global innovation leader in ophthalmic lenses : Essilor. An address where rigor and dynamism combine perfectly. Selecting a Reiz frame means choosing a minimalistic yet elegant and subtil design. Optimal comfort is enabled when fitted with the latest lenses Essilor Eyezen Sapphire+.